Woken again in the middle of the night by Rammstein, today we faced more dunes, followed by the mother of all dunes to finish. The previous night’s briefing had described it as a “motocross race”, three 20km laps in the dunes of the Erg Chebi for us moto amateurs and five for the Pros, followed by the final special for the bikes only, a blast to the top of a huge dune, riders have to complete it any way possible, so if you don’t manage to ride all the way up it, you dump your bike where it stops and continue on foot… easier said than done! Not having been able to beg, borrow or steal a battery charger, I was up early and went for a long blast on the road out of town and back again to get some charge in the battery. This was only partially successful but it was just about starting on the button. John turned up to the start for a few photos but having spent most of the previous day out in the sun with no shelter at CP1 he was now feeling the effects and retreated to bed, where he had to spend most of the day feeling very ill.
At the start we were to leave in groups of four and rode straight into a section of low dunes that were getting increasingly cut up and very difficult to ride. Donna from Torque Racing had spotted an alternative however. To the left was a small “valley” between the dunes with a hard stony surface, by veering left from the start you could use this to bypass the first soft dunes set and get away cleanly. I watched the Torque supported riders in the Pro class riders use it to great advantage, so when it came to my turn, I lined up on the left but was slightly concerned to see that a number of spectators were creeping into this area but luckily in the wave before mine, a rider took this route and they all jumped back rapidly! This gave me a clear run and I too had an excellent start. This time we were soon into large dunes and I took great comfort that sticking to my own game plan and seeking out virgin sand, largely by surfing round the shoulders of dunes rather than straight over the crests, I was making smooth and steady progress, passing several fallen and bogged down bikes as I went. The first secret CP was on top of a big dune, which looked a struggle to get up as the multiple tracks up its face made the going very soft and steering was clearly difficult. I decided to loop round the right and see if I could approach from the other side. This was going well until I spotted some tracks going up the right hand face of the dune under which I was traversing and thought “well they look like they made it”, so I turned and fired up the side. Unfortunately I failed to get enough speed up and stopped with the back wheel buried about 20 metres below the top. I decided discretion was the better part of valour and walked the rest of the way up, which was not easy! Returning to the bike I could feel my back getting wet, so pulled off my rucksack to check my camelback only to discover it hadn’t sealed properly and I had lost almost all the water. Balancing precariously on the side of the dune, I refilled it using my 2 litres of emergency water only to promptly drop the camelback and spill every drop. I considered climbing back up to the CP but it was operated by two guys on bikes, so they were unlikely to have been able to carry much water with them. I looked at the roadbook and the next “official” CP was not too far away and there was a “fast sandy piste” leading to it, so I guessed (correctly it turned out) I would not be in the dunes for long, I decided that would be a better bet as being out of the dunes, was more likely to have a car or a truck there with plentiful water supplies. I turned the bike round, headed down the slope and sure enough the battery was dead again! I kick started it and checked the road book, the route onward left the CP on the opposite side of the dune, so it looked like I had to get over it anyway. I rode up to the shoulder behind the dune that I had originally planned to use, a very easy climb and then turned left to follow a gentle, firm slope to the top, I should have stuck to my original plan!!! Passing the CP I could see the sandy piste running from right to left in the middle distance, most riders had just headed straight for it over a long series of dunes before turning left onto it. But I could see that there was a series of stony dune valleys heading off to the right that eventually connected to the piste, so I followed these for some really easy riding and picked up the piste about 500m further to the right. A quick reset of the trip meter as I passed where most other riders had entered and I was back on track…. Racing with your brain certainly pays dividends. Luckily I soon came to another secret CP, this time they had a 4x4 and plenty of water in the back, I took the opportunity to fill both my 2 litre camelback (and seal it properly) and 2 litre emergency water bottle and get another 1.5 litre bottle down my neck! As I got going again on the sandy piste, I thought I was doing well, keeping the speed up to make the riding easier, until that is the leading moto pros started to pass me on their second lap, those guys were travelling at twice my speed!!! Another CP and we turned back into the dunes, this was going well, I was getting the technique nailed although still had the occasional stall or buried the back wheel and the waits for the bike to cool so I could get it into neutral and kick start it were getting longer. At one point I had stopped on a high point to scout out the route ahead, when I heard the unmistakable sound of a truck approaching. Looming straight towards me was the truck going at full chat! The crew gave me a thumbs up and the navigator indicated I should stay where I was (I had no intention of moving anyway) and they powered over the dune about 2 metres away from me, scary stuff but exhilarating at the same time. Getting moving again I then made the classic mistake, it was approaching noon, a handicap of being in moto amateur as we were starting almost two hours after the first competitors (Car Pro) each day and an hour after the Moto Pros and the lack of shadows meant it was again very hard to judge the terrain. I crested a large dune at speed and what appeared to be a large flat top, wasn’t and I launched off the top and cartwheeled down the slope. I was luckily thrown clear of the bike but my relief didn’t last long as I then face planted in the sand! I had the wind knocked out of me and sand everywhere, up my nose, in my mouth… not nice. A cursory check of the bike and it seemed OK, the road book was flopping about as the adjustment bolt that had been holding it in position had stripped on day one and I had replaced it with a zip tie; this had snapped. The back end of the bike looked a bit battered too although I didn’t realise quite how much at the time. I knew I was in a dangerous position being out of sight below the crest of the dune with a lot of traffic coming through, a fellow rider narrowly missed me coming over the top and shouted at me to get out as quickly as possible. I still had sand everywhere and the bike to get started, so decided to put the agreed warning sign up, which was to place my crash helmet on the dune above me… but I just couldn’t climb up the slope! Every step I took I just slid backwards, so instead I got the bike into neutral as quickly as I could; kick started it and just ran it out of the danger zone to a safe spot on high ground. Then I went and collected up all my kit and attempted to get rid of the sand before replacing the broken zip tie on the road book and eventually getting underway. I was struggling now as I hadn’t realised just how much the crash had taken out of me but plugged on as the route crossed dune crest after dune crest before eventually looping to the right and allowing me to follow a long dune ridge by staying up on the top. The route headed across the flank of a huge dune with a CP up on a saddle on the side. The route to it looked fairly fearsome, a very steep slope across a concave bowl that had formed below the saddle and by now cut to pieces by the previous traffic. Instead of following the herd, I turned across the track and powered up the far right hand side of the bowl staying on virgin sand and climbing almost to the height of the saddle before looping across to the CP… simple! At the CP I bumped into Gary Pitchford who seemed to have arrived without his bike! It seemed he had just left it in sand some distance before and walked in. 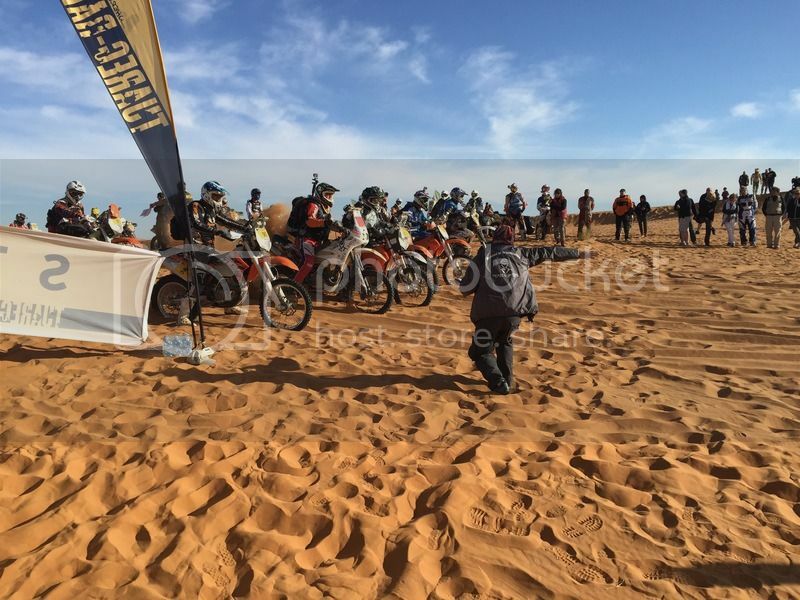 I checked in and grabbed a drink and got on my way, more dunes, fall, stalls and increasingly long periods of trying to get the bike into neutral followed. Heading towards the next CP I fell off on some very soft sand on top of a dune and ended up under the bike, with it upside down on the slope of the dune! Luckily another rider came to my aid and lifted the bike off me and helped me to pick it up. Gary also turned up and we rode up to the CP together, I left before him but he passed me soon afterwards. After the CP, the dunes started to empty out and I spent long periods on my own just picking my way through the dunes. 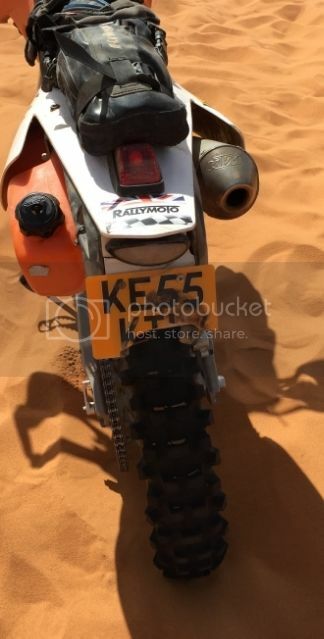 The bike was getting more and more uncooperative and on one occasion when I bogged down in soft sand, it took twenty minutes before I could get it into neutral and restart it. The dunes started to get lower with more stone filled valleys between them so I used these where possible to aid my progress although this did result in a rather meandering route. However one of these depressions was almost my downfall, at times it was almost impossible to steer in the soft sand that had a consistency like talcum powder! I rode down into one dip between dunes to find it was not a hard stony surface but a bowl of soft sand. In the centre was a large clump of camel grass but try as I might I couldn't steer round it. Thinking "oh I'll just ride over it" like I had over numerous others, I just kept the throttle open and stopped dead as I hit it! I went over and desperately tried to get the clutch in but failed and the engine died, cue another 20 minutes of trying to get the gearbox into neutral! Luckily considering my very meandering route my GPS was working fine today, so it was an easy matter to keep an eye on the track and ensure I was heading in the right direction. Then the dunes started to get bigger as we took a definite turn to the left and headed towards the “Big Dune”, I could already see riders on the top, yet I had another two laps to complete before I headed up there. However it was looking increasingly likely I would run out of time to complete them as today’s stage had a cut off time of 13:00 and that was fast approaching. 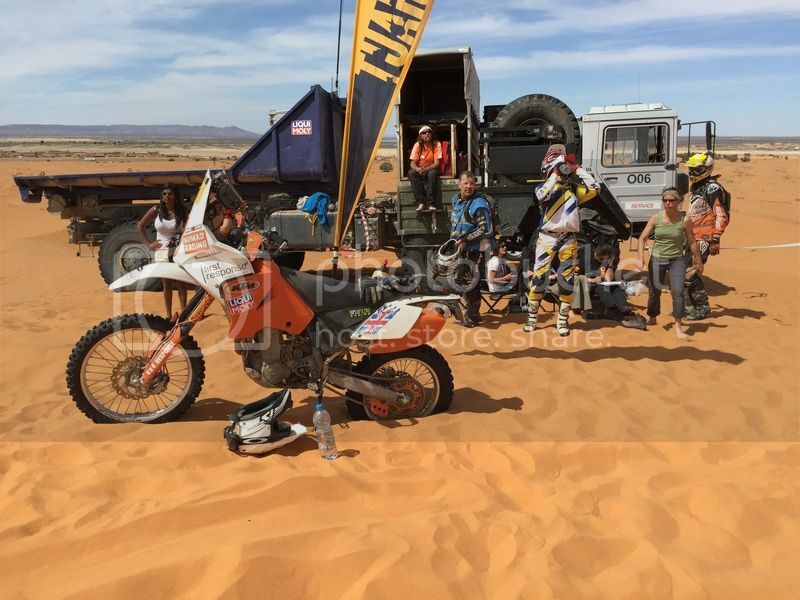 I got to the point where only two large dune “walls” stood between me and the last CP on the lap and both proved to be difficult, stalling on the soft sand at the top of both, again with long struggles to get the bike into neutral. I eventually rolled into the checkpoint to be informed I was three minutes out of time! Again I thanked them profusely that I didn’t have to go round again. 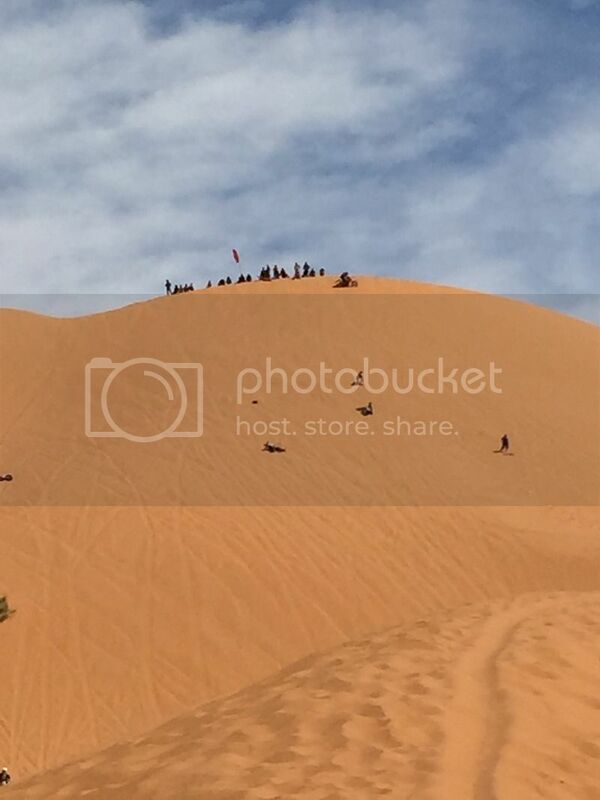 I spent some time drinking a bottle of water and watching the riders who had made the cut off attempt to climb the big dune, which by now was getting very cut up and soft. Sure enough very few were now making it to the top. I also took a look at the bike and found I had done rather more damage to the back than I realised. I had lost half the number plate, snapped the rear light mount and the rear mudguard had obviously been bent in half by the back wheel and ripped its mountings. A few zip ties were used to hold it all together. Gary rolled up and we had a chat and a photo opportunity, Gary the cheeky sod asking a young girl to "take a picture of me and my Dad!" I headed back down to the start of the lap and then the short distance down the road to the hotel where I went straight in for a shower…. Cold again! John was sound asleep when I got back to the room having had a fairly miserable day but by that time was starting to feel a bit better. Having the early cut off did mean a restful afternoon and getting some maintenance done on the bike, ready for the next day when we were to return to Zagora. We had a problem however as the stage was an approximate reversal of day two and the fuel point at CP1 was 180km into the stage. We headed almost straight towards it but the service route looped away to the north to stay on the tarmac and it was doubtful that John would make it there in time in the car unless he left before dawn. 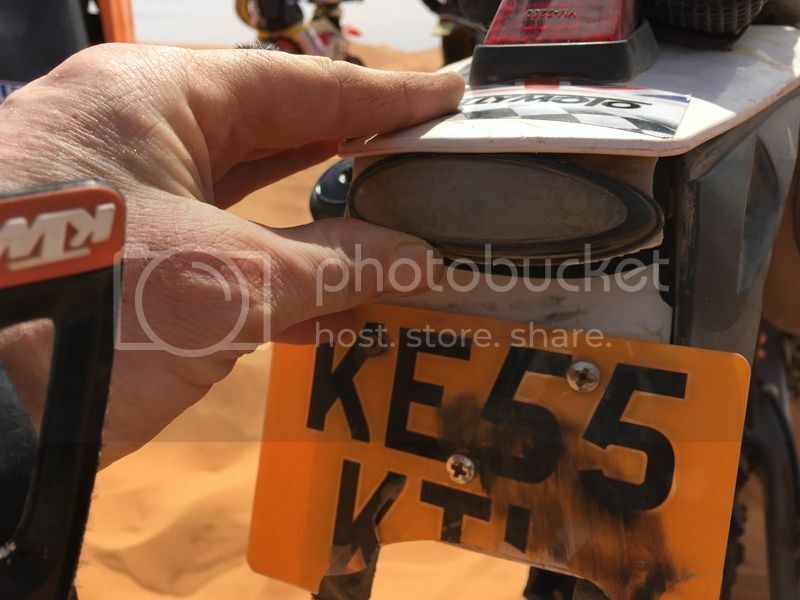 Still not 100% he was not keen but then discovered from Donna that the organisers would take a fuel can to CP1 if we labelled it with my name and race number, so John promptly did and took my 20 litre Jerry can that he had refilled that day straight to them… problem solved. Most evenings we had a regular pattern: go to the briefing, go to dinner, mark up the road book and make any amendments that had been advised at the briefing, then bed. However I had taken advantage of the early finish and stuck together my road books for the next three days and marked them all up that afternoon. As my fuel can was now on the organisers trailer ready to go to CP1 tomorrow, I decided to go and fill the bike up rather than do it in the morning. The fuel station was 7km out of town and I managed to upset an awful lot of Moroccan drivers on the way there and back with my ultra bright LED headlight... whoops! That duty finished, I dumped my gear and headed back down for the briefing, followed by dinner and then an early night!